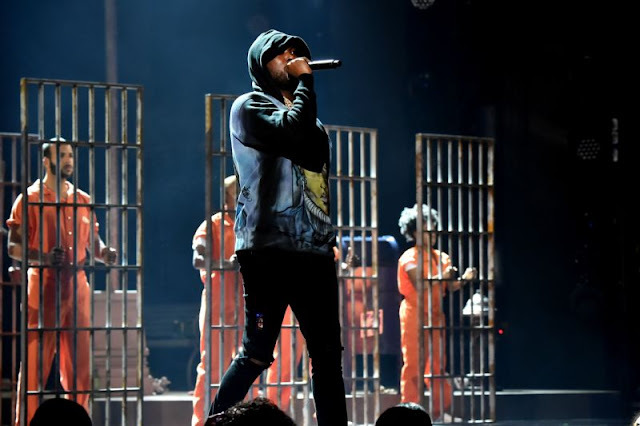 Recently freed from prison, rapper Meek Mill made a controversial appearance at Sunday night’s (June 24) 2018 BET Awards, debuting his new song “Stay Woke” with a striking performance touching upon gun violence, criminal justice, and the role of police within the black community. The Philadelphia-bred rapper took the stage followed by an introduction by fellow Philly natives Lil Uzi Vert, Kevin Hart, Questlove, and Black Thought; and blasted out one of the nights’ most memorable segments on a set dressed to appear as a big-city ghetto neighborhood. Various acts of violence were depicted as backdrop; the shocking centerpiece of the performance came when a young girl was depicted as hit and killed as an innocent bystander. For a brief but jarring period, the audience was assaulted by the horrific sounds of a mother’s loud wails over her child. As a denouement, an actor depicting a police officer laid an American flag over the child’s body, and the stage transformed into a jail setting. The new tune featured singer Miguel, who shadowed the performance throughout. Meek additionally gave tribute to the late rappers XXXTentacion and Jimmy Wopo–both of whom were killed in separate incidents Monday, June 18–by wearing a hoodie displaying both of their images. “Stay Woke” marks the first new music from Meek Mill since his release from prison in April. His last album was 2017’s Wins & Losses. The 2018 BET Awards were held at the Microsoft Theater in Los Angeles.